For the past two weeks we’ve followed the government’s misuse of evidence on NHS reforms, remembering that they’re perfectly permitted to reform things with no evidence at all, like everyone else does, they just shouldn’t pretend to have evidence. On Thursday health minister Simon Burns appeared before a BMA meeting in London. He tried to persuade a room full of nerds that the pathfinder initiative was a pilot scheme, to test the reforms before national roll out, even though this “pilot scheme” covers more than half of all the patients in England. Then he explained that doctors obviously don’t understand what the word “pilot” means. Then he explained that the evidence of what doctors say to him when he meets them is more reliable than good quality survey data. 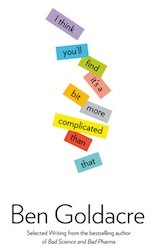 Things get tricky when evidence collides with what people would simply like to crack on and do anyway. At midnight last night, the Medicines and Healthcare Regulatory Authority closed its consultation on how they should label homeopathy sugar pills without misleading the public. You may not think this is a difficult task, but politics makes it so. To recap: homeopathy pills don’t work better than placebo dummy pills in trials. They are made by taking one drop of the original substance and diluting it in 1,000,000,000,000,000,000,000,000,000,000,000,000,000,000,000,000, 000,000,000,000 drops of water, then taking one drop of that solution, which is now just water, and shaking it near some pills, which you then buy to treat an illness. Current MHRA wording says: “a homeopathic medicinal product used within the homeopathic tradition for the treatment of [whatever condition]”. Homeopaths like this because it’s ambiguous. Their internal lobbying document (which I have helpfully posted on the internet for everyone to read), explains that this wording “avoids the need to prove the science” and so “allows us to practise as normal”. Can the MHRA walk the line between evidence, politics, and clarity? Quack remedies are in their own world of silliness, but we are entitled to have higher expectations of regulators, since they themselves expect to be taken more seriously. Lacking optimisim, I have conducted my own consultation online. Here are the suggestions. On instructions we have “take as many as you like”, since there are no ingredients. The proposed belladonna homeopathy pill ingredients label simply reads “no belladonna”, which is a convention the MHRA could adapt for all their different homeopathy labels. Other suggestions include “none”, “belief”, “false hopes”, “shattered dreams”, and “the tears of unicorns”. For warnings we have: “not to be taken seriously”; “in case of overdose consult a lifeguard”, and “contains chemicals, including dihydrogen monoxide”. DHMO, of course, is a scary name for water, which became an internet meme after Nathan Zohner’s school science project. He successfully gathered a petition to ban this chemical on the grounds that it is fatal when inhaled, contributes to the erosion of our natural landscape, may cause electrical failures, and has been found in the excised tumours of terminal cancer patients. These label suggestions are clear, unambiguous, and they do not mislead anyone. If you think they are funny, I invite you to notice that besuited people in your medicines regulator have just run a lengthy official consultation on how to label sugar pills so as not to mislead the public. People who claim to be serious should be serious. Like homeopathy boxes, this post needs moar lolcats. On the same day the MHRA’s consultation closed I got an email from the Government in response to a petition about homeopathy I signed in June last year. I can barely remember what it was about (well, obviously it was critical of homeopathy) but the response is predictably woolly. Thank you for writing this post. Reading this blog makes me feel like I’m not the only one who gets fed up with quacks, quack medicine, lack of research and people who say “Well there’s no science to support my arguement but so and so said…” Reading a really good book atm by Michael Maboussin called “Think Twice”. He details some research that has shown on average, people are more likely to believe in a treatment based on anecdotal evidence than statistical data…to the point that they would prefer to have a treatment that had a 30% success rate but a good anecdotal account than a treatment that had 90% success rate but a bad anecdotal account…gives some insight into the mind of Simon Burns…Scary. I love this. I’ve only been awake about 10 mins and I have had a good laugh at Ben’s blog, and found out about Maboussin re secondfresh, and bought “Think Twice” for my Kindle. Good start to the day. Ok so there’s no punchline, but it serves its purpose. I’ve been following Ben for a while now, but I’m fairly clueless about why this is still dragging on. Evan Harris surely can’t be the ONLY non-mental MP? I reckon a possible ‘solution’ to this problem can be had by ‘diluting’ the industry. I mean exactly how pure is bottled water? They certainly don’t quote impurities down to the 10 power. Who knows what might be a half litre bottle of Volvic and what great homeopathic properties it might have. Let every bottle water manufacturer make homeopathic claims and see what that does to the industry. It’s not just what is in the water (which for 330ml of volvic, 1.1 x 10^28 molecules water, 30C dilution = 1 molecule per 10^60 water molecules, is likely to be none of the original) but what the water remembers has been in it before e.g. someone else’s wee, some cholera toxin, some plutonium. All the stuff actually in the volvic is there at massively higher concentrations than the homeopathic stuff, which is why of course it has no effect; just not dilute enough. And then you have to bash it for a bit against a special leather thing or it wont work. Just don’t carry your Volvic in your satchel and you’ll be fine. Obviously if you have actual evidence, or at least, a post hoc occurrence, then I would say it’s a better basis for action than some indirect tale that may have been distorted or lost its relevance on the way. It’s worse than that – Evan Harris isn’t an MP any more. I queried on the MHRA’s consultation if legislation preferring; “white, middle class, gullible traditions, over the traditions of those from other ethnic backgrounds” might constitute a form of racism. Come on you have to give the civil servants something to smile at whilst they attempt to shirk their responsibilities. The MHRA draft claims that Homeopathic preparation should have indications because not having them would confuse the consumer. But the S&T Committee Review complains that having indications not backed by science confuses the consumer. I think their is an evidenced based way of determining which is more confusing. Look at consumer behaviour. Since people buy homeopathic products they are clearly confused by the current scheme that allows indications. If we remove the indications and people buy fewer products, then we will know this makes them less confused. We can easily establish I am correct by a well designed trial. I suspect if Homeopathic products didn’t have indications they wouldn’t fall under the remit of the MHRA. Are they just trying to preserve their jobs? Too funny. It’s a shame these products prey on people’s hopes for recovery from illness, but at some point….people need to be proactive and do their own research. Ingestion of older drugs like tazepam or aspirin probably won’t come with any surprises….newer drugs are more suspect. All you have to do is read the inserts (with those teeny, tiny fonts) to see that OTCs are “tested” by a handful of healthy people taking the pill, once. Not reassuring when a drug is new. The real test is veterinary medicine. The head of our vet tech program was a homeopathic vet. Say what you will about this fluffy style of medicine – but so far as we know, dogs and cats do not experience placebo effect. Which is how glucosamine-condritin gained a good reputation. Except there’s no oversight on quality. Wired has a great expose on toothpastes and cold medicines – although where they find the ingredient lists (like Colgate) is beyond me. I couldn’t find them anywhere else. Oh right, my posts get deleted from here too. Nice. I’ve been wondering about veterinary homoeopathy and why it seems to work for a while. I would guess that, although animals presumably don’t do placebo effect, their owners do and this affects outcomes. What is the evidence? Domestic animals have effectively been selected over thousands of years to be responsive to their owners and are also dependant on them for their livelihood. They’d damn well better be hyper-sensitive to the behaviour not just of their owners/pack leaders/local dominant, but of other humans around them such as vets. The same thing may apply to a lesser degree to herd animals. Of course we can all have great fun with homeopathy and its usually ridiculous advocates. But it does raise awkward ethical questions about the placebo effect, the usefulness of magical thinking and also whether benign neglect can sometimes be the best option. I think studies into sugar rushes in kids are relevant to the veterinary homeopathy debate. Under controlled conditions, a study was unable to distinquish between kids who had and hadn’t ingested sugar. However, in another study, a group of kids (whose parents felt sugar sent them nuts) were all given non-sugary drinks, but half the parents were told otherwise. What the researchers noted was that many of the kids in the (deceived) ‘sugar group’ went hyper; and more interestingly that the ‘sugared’ kids’ parents were generally more anxious and interventionist (it’s a while since I’ve read it though). I suggest this shows that certain effects not only exist in the imaginations of onlookers, but those onlookers are also able to bring about certain expected effects in others – just by how they are with them. I know the wife and I enjoy playing ‘homeopathy dog’ with our pooch. Interact with him all doey-eyed and concerned (as if he’s unwell), and he becomes all timid and feeble (reinforcing our mock preconceptions); but interact as if he’s ‘all better now’ (perhaps following some special water or sugar), and he springs back into life! Sorry, I did not mean to imply that homeopathic medicine is effective. I don’t think it is. My point was only that glucosamine chondroitin is a good example of a supplement that was tested in real time on dogs and seemed to actually work w/o benefit of placebo effect (although I prefer the vegetarian kind since the regular kind requires the slaughter of sharks). If a good number of domestic animals showed marked improvement after being given homeopathic treatment, then I would think it was worth investigating further, as with glucosamine. Arthritic pets are NOT going to miraculously get better just because an owner is optimistic or gives them more attention. A study where 5 out of 20 dog owners ‘believed’ that homeopathy had helped their dogs’ dermatitis after ‘at least 2 months’ (regression to the mean? Conformation bias? Placebo? Mistake?). 3 of these 5 then went on for a blinded RCT (as one got completely better, and another died of an epilpetic seizure), of which all owners distinguished correctly between placebo or homeopathic remedy. A statistically insignificant RCT on 3 dogs owned by homeopathy believers basically. There are more – unfortunately I can’t access them – but none seem to be of the double-blind RCT standard. Whether more arthritic dogs ‘miraculously get better’ after taking homeopathic sugar pills than those who take normal ones, or none at all, I’m not sure. As I understand it, the science is very much reliant on owners’ accounts and how they’re feeling about the situation. An owner whose just glad their dog’s finally getting ‘treated’, may be considerably less concerned and more optimistic around their pet that one whose in a hopeless situation where nothing can be done to ease their pet’s suffering. Like I say, I’m no expert, so aren’t even sure if glucosamine-condritin is a homeopathic remedy? If it’s consistently passed double-blind RCTs, you’d assume it wasn’t – do you have any details? I’m not sure this is quite as simple as all that, is it? OK, homeopathic pills don’t work better than blind placebo. But, we know that the placebo effect is real. So, if you put on the box ‘does not work’ or ‘contains no active ingredient’ will that not break the placebo effect for people who could genuinely get a considerable benefit from it for conditions that might otherwise require drugs which would have serious side effects? I appreciate that if people use these pills in cases where they really need chemotherapy or antibiotics, that’s a bit of a disaster, but if they have a condition where they can use a cheap placebo with no side effects and feel genuinely better able to enjoy life as a result, then changing labelling so that the pill no longer works does seem a bit counterproductive. Emmy, you says pets won’t get better, well perhaps they will. That’s why we have trials. Glucosamine is a good case in point. It had lots of anecdotal evidence in humans. The first few trials were encouraging and GP’s started to prescribe it, but now later larger trials have disproved it and shown it has only a placebo effect. So we no longer prescribe it for humans. A good example of evidence defining the place of a drug as purely a placebo. Emmy, re “miraculously getting better” – our Golden Retriever developed rheumatoid arthritis. So did my wife – at aboput the same time. Over a period of more than 5 years, neither had any treatment (human drugs have awful side-effects and some serious risks – too much for a 40-year-old to want to take them for the rest of her life). Sometimes the arthritis was there – sometimes it wasn’t. Sometimes they could do a 10 mile walk in the Lake District without any problems. Sometimes a mile was too much. That’s what arthritis is like. Fifteen years later, my wife still has arthritis. Still has no treatment. Fingers are gnarled. Sometime joints are painful. Sometimes not. That’s just how RA is. Now if you want a treatment that REALLY CAN improve RA in dogs and humans, look no further than swimming and/or other exercise in water. Worked for my wife and the dog. Difficulty for many patients is that it’s hard work, and swimming pools can be hard to find, whereas popping pills is relatively easy. Paradoxically, the vet reckoned the effects of the dog’s RA on her joints were worse because she had swum every day – up to to a mile a day in the local river- for the whole of her life. The thing is that placebos work even if you tell people you’re giving them a placebo. So we could label homeopathy medicine accurately, and yet still keep all those practitioners in gainful employment. It’s win-win! Sorry homeopaths, but your stuff does not work on animals, well at least not on those under veterinary care. Yes, we do have a few veterinary homeopaths cluttering the place up, but hey its a privatised industry and not the NHS. If owners will buy it, you can sell it! Once you have sold it, it sure had better work, or the owner is convinced (by you) that it has worked. Chondroitin sulphate and keratan sulphate are not homeopathic products, but what the alternative medicine mob call natural products. They sell by the bucket load to treat OA in dogs and horses – they dont work in these animals either, in the same manner as they dont work in humans……… but I havent heard of an overdose yet. @tomrees I understood that the research re: placebo & working even if the user knows is very much at an early stage? And wasn’t there something also fairly recently that suggested that belief may improve the efficiency even of drugs that do definitely perform better than placebo (could be very wrong about that, only saw it in passing). I would have thought that if you mark up homeopathic products as ‘no ingredients’ you would greatly reduce the number of people recommending and taking them: it would surely be a challenge to the marketing department. 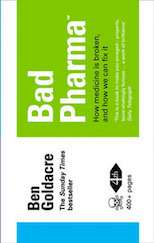 If people are experiencing genuine relief as a result of the placebo effect, would that make the world a better place… even if it is a place with a happier Ben Goldacre? It is interesting that there are repeated claims about the “placebo effect” – claims that Ben himself repeats (2 “sugar pills” better than one, colour of pill making a difference, injection of saline better than a pill, etc). This represents an attempt to “objectify” a “subjective” response. These “placebo effects” are not uniformly cross-cultural. There is a social expectation that is part of the construct of the placebo effect. It would be more accurate to assume that the placebo effect really equates to the therapeutic benefit of the “doctor”-patient relationship – the “placebo” is not the “pill” but the “doctor”. As for Governments and politicians “pretending that evidence is difficult and complicated” is to ignore the fundamental aspect of politics: public opinion. Public opinion is, more often than not, not based on any “real scientific evidence”. It is driven by “perception” far more often than by “reality” – sometimes to the extent that the perception “becomes” the reality (which we call “conventional wisdom”). If you say something often enough, people start to believe it. It doesn’t have to be the “truth”. When “evidence” starts to win votes, then the politicians will pay attention. Until then politicians will find it difficult and complicated. You may as well have a discussion on “qualified franchise” – as this is the only way proper evidence is going to affect the vote. “Dogs treated with Glu/CS showed statistically significant improvements in scores for pain, weight-bearing and severity of the condition by day 70 (P < 0.001). Onset of significant response was slower for Glu/CS than for carprofen-treated dogs. The results show that Glu/CS has a positive clinical effect in dogs with osteoarthritis." (This is just one study but others I've read had similar results). A few studies showed "radiographically severe osteoarthritis" was not helped by this medicine. Which brings me to the point that arthritis may not have been the best example to bring up – but my point was, this complementary (NOT homeopathic) treatment, was shown to work in dogs and I saw pet owners impressed enough to try it themselves. Homeopathic Tx has yet to show such impressive results in companion animals. Point is, if we can humanely and even helpfully test it in real time on pets, we can ponder if this elimiates the placebo effect – and reduce the number of lab animals that are being used. (Meant to say, “helpfully test alternative treatments” in general. Sorry). Anecdotally … our neigh(! )bour has horses which she swears benefit from a pulsed magnet doobry. Well they certainly exist in me if I have had a hard day walking or climbing and am feeling tired and low in energy; a Mars doesn’t half help put a spring in your step ! But in terms of adding extra to a normal metabolism, I agree ! How then is one to act on one’s own experience ? I am not in conflict with the philosophy in regards drug treatments etc., merely asking how one can proceed. I know of five people who have died from treatable conditions [eg headaches->subarachnoid haemorrhage], who were waved away by their GP from more tests, possibly on cost or a similar basis. Does that make me interested in eliminating rare but catastrophic conditions – yes, even though I have not undertaken a controlled trial. We need a new profession in this country called “Medical Performance”. It gets around the ethical problems of handing out non-medicinal medicines, while enabling the distribution of funny herbs and/or water with maximum placebo effect. It would be perfect work for resting actors. I agree with you, this is more complicated than just saying “it is only placebo, therefore it DOESN’T WORK” and put it on the label. Placebo works, and homeopathy works, just not more than placebo. Interestingly, I know dozens of people who fully recovered from various medical conditions with the help of quack stuff. Not just homeopathy, but acupuncture, reflexology, flower drops, reiki, vegan diet, aromatherapy, you name it. These were real illnesses with previous medical diagnosis, where academic medicine had either nothing to offer, or only with serious risks or the waiting list would have been 2 years. And here I’m talking about asthma eg., not just some wishy-washy insomnia. If placebo is capable of this much, maybe we shouldn’t try to eliminate it so eagerly. I think he is wrong. In the first case he is either naive or hasn’t really been ill yet. Sadly, doctors very often have to tell patients that there is nothing they can do to help them get better. As for mainstream medicine triggering the placebo effect, this is clearly not always true for some reason. CAM therapists will tell you of uncountable cases, when they have treated (and healed) people who have tried everything that doctors offered, and no placebo effect ever kicked in. Then they try homeopathy and ta-daaa, the placebo effect heals the patient. Is it the right thing to stop people harnessing this powerful process?, I don’t think so – their minds heal them somehow but they need the ritual to trigger that healing process. Scientists can of course carry on being angry about quacks, but medicine, the main job of which is to make people get better, not that it should apply only science in the process, should at least be a bit more careful and understanding. We should also decide how to prevent people from using homeopathy when their life is in danger if they don’t see a doctor soon. 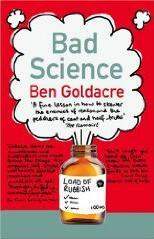 But ridiculing the placebo trigger on the label just so Ben can have a laugh, is not really very useful, I don’t think. 1) They accept homeopathy doesn’t work beyond placebo. 3) Patient choice. The document points out that PCTs (Primary Care Trusts, soon to be disbanded if the recent health bill passes its 3rd reading) have the say in what treatment patients can receive, not the central NHS. If a patient can find a GP who will prescribe a homeopathic solution, the NHS has a duty (in providing patient choice) to ensure that the PCT has access to that treatment. Hang on. What if (a hypothetical, but not impossible example) a qualified registered GP from a culture that believed exorcisms were the answer to behavioural problems in children, prescribed exorcism as the best treatment for a patient. And (OK, more unlikely) the local PCT agreed this was a valid treatment. Would the NHS then have the policy to invest in excorcists should such a demand ever arise? According to their own logic they would. Well, actually what I want to know is which PCTs (or what proportion of them) approve hoeopathic prescriptions, and which don’t. Questions about how much the NHS actually spends on homeopathy were fobbed off with replies along the lines of it being a proportionally tiny amount, and therefore collecting the exact figures would be a disproportionate waste of money. When I went to my GP and enquired about private hernia surgery he glanced down at his blotter pad (with a BUPA symbol in the corner) and gave me BUPA’s number. When I told him my private insurer was one of BUPA’s competitors he looked blank. When I then asked him “what should I do, Google for surgeons?” he replied, yes. Since homeopathy medicines are so incredibly dilute, any particular homeopathic medicine should also contain homeopathic quantities of every other homeopathic cure. In fact, all water should contain homeopathic quantities of every homeopathic cure. What are homeopaths going to do – take out all the other homeopathic stuff? So a glass of water taken randomly from a tap will contain all the homeopathic medicines, at fantastically dilute quantities, that you will ever need. No need to buy these expensive homeopathic medicines. And if you find the the water is too concentrated, you can always dilute it, use a bigger glass. That is the case of all water on Earth. Consider how, according to homeopathic principles, we are all just drinking super-strong piss. Did anyone here take part in the “mass overdose” outside various Boots stores last year? It is shocking that these pills are not banned really. People do themselves harm by buying this “medicine” to treat themselves and their children. A friend’s child recently took a strong knock to the head – the treatment was some “arnica”, although not real arnica, not straight from the plant, but homeopathic arnica!